People looking for affordable housing in Ottawa will benefit from a $15 million investment from the city. As part of the tabling of the city’s 2019 draft budget Wednesday, Mayor Jim Watson announced the funding will be used to create affordable units this year. About $10 million will go into the city’s housing reserve fund and the remaining $5 million will be invested. Watson also proposed a “significant contribution of Ottawa lands” to increase the values of the city’s investment in affordable housing. 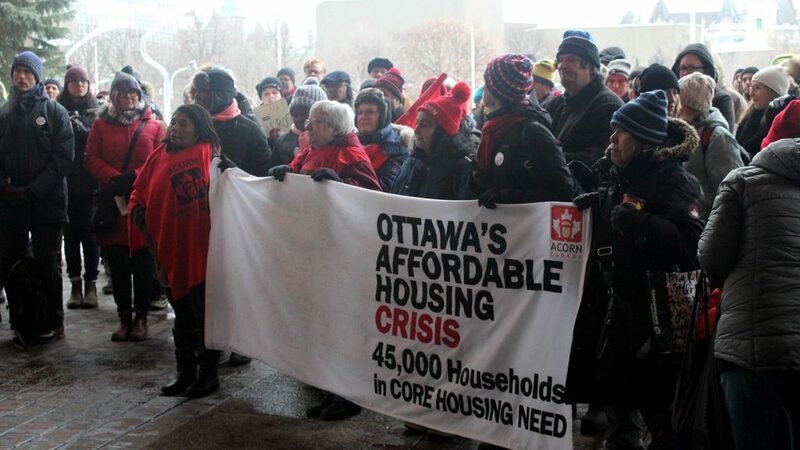 Before council met to consider the budget, a rally organized by Ottawa Acorn was held outside city hall. Some 64 organizations in the city drafted four demands for affordable housing. One of which called for an investment of at least $12 million this year and a zoning by-law that would ensure 25 per cent of new developments are dedicated to affordable housing. Councillors Mathieu Fleury and councillor Catherine McKenney also appeared at the rally. McKenney called the affordable housing issue in Ottawa a “crisis” and said the city had an opportunity to make a change moving forward with the budget. “Don’t listen when they tell you that the private industry can solve this,” said McKenney to the crowd gathered at the doors of city hall. Inside the building, Watson said the $15 million investment will be the largest municipal contribution to housing in Ottawa’s history. “It’s a start,” said Judith Taylor, who has lived in the Dalhousie Non-Profit Housing Co-operative since 2009 and currently sits on the co-operative’s board of directors. “After the Harper government, it’s better than nothing,” she said. Taylor said creating affordable housing in Ottawa goes beyond a lighter rent bill. “It means stability in housing, it means healthier housing, it means that you can actually talk to your landlords and get things done,” said Taylor. Watson also mentioned that he had met with federal Border Security Minister Bill Blair and had outlined the need for financial support as the city has been housing a growing number of asylum seekers since 2017. “I am very confident that the government of Canada will be reimbursing the city for these costs in the coming weeks,” he said. Once confirmed, Watson said the money will be used for the construction of new affordable housing in Ottawa. The city hopes to approve the construction of more than 250 new housing units this year.